where $R_0$ and $R_a$ are the inner and outer radius of the tube, respectively, $h_1$ and $h_2$ are the inner and outer heat transfer coefficients, and $k$ is the thermal conductivity of the wall. How does Eq. (1) simplify for the $T$-profile shown on the left? I had seen a similar $T$-profile in one of our exercises and there they used Eq. (1), however when selecting option 1, I get "incorrect answer". How can you tell from looking at the $T$-profle what the equation for the overall heat transfer coefficient will be? All help and hints are appreciated! This is the heat equation analogue to Ohm's law, in which resistances are additive (in series), and hence the inverse conductances are additive. 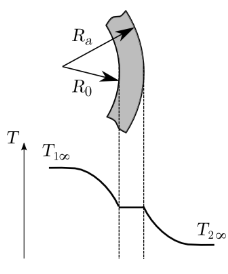 The way to reason is that the full equation (1) for the heat conductivity (1) contains three terms: one for the interior of the tube, one for the tube wall, and a third for the exterior. When you look at the profile, it becomes evident that, since temperatures immediately adjacent inside and outside the tube are equal, the tube has infinite heat conductance ($k=\infty$). The right answer is therefore 3. Not the answer you're looking for? Browse other questions tagged thermodynamics heat chemical-engineering thermal-conductivity or ask your own question.